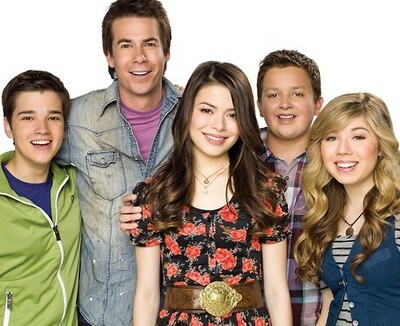 (L-R) Freddie, Spencer, Carly, Gibby and Sam. Carly and Sam: And this is...iCarly! iCarly is a Nickelodeon teen sitcom, created by Dan Schneider about Carly Shay (Miranda Cosgrove), creative in her mid-teens living in Seattle with her big brother/guardian Spencer (Jerry Trainor) and whose father has been deployed in the military for an decade or so. After an accident where her comments on a talent show and a Sadist Teacher made it onto a YouTube-esque site, the positive internet reaction inspires her to make a creative web show with her best friends: Samantha "Sam" Puckett (Jennette McCurdy) and Fredward "Freddie" Benson (Nathan Kress). Sam is a detention hall regular (and had been arrested several times) who craves meat, frequently mentions that her relatives are in prison or in parole, and keeps an array of dangerous tools in her backpack and locker. Freddie is an intelligent tech-savvy boy who has a crush on Carly, runs the iCarly website and works the camera for the show, and has an extremely overprotective and neurotic mother (Mary Scheer). The trio is often joined by their friend Gibby (Noah Munck), an eccentric pudgy kid with a penchant for taking his shirt off. The web show consists of various random and surreal sketches brainstormed by the kids themselves, resulting in skits like: Turtle Races, Meatball Wars, Who's That Weirdo in my Neighborhood? and Animals Dressed as Other Animals, amongst others. Some are related to fan-submitted clips, such as hatching chicks for a science project, inspired by a boy who thought sitting in a bathtub full of scrambled eggs and laughing manically was a perfect way to proclaim his love for the show. Occasionally, they have guests, such as a strange kid who never speaks but will eat or drink anything like Sam's quarter or pureed spaghetti and meatballs, or the tallest man in the apartment building (so tall his head wasn't shown on camera) to talk about recycling. When they experience technical difficulties, they cut to funny things such as a picture of a man with shrimp up his nose and a video of a rabbit eating peanut butter. Most of the show revolves around some aspect of producing the show whether it be acquiring musical guests, dealing with rival web shows, Product Placement, special "On Location" episodes like detention or a creepy abandoned apartment or with the trials of popularity and obsessive fans. At times, even Spencer's personal issues and quests make its way to a broadcast of iCarly. Their school is only slightly more normal. Some end up wearing chicken suits, others terrorize their classes after bad breakups, and others express deep hatred for three-holed paper. And those are the teachers. Interweaved amongst the webshow and school shenanigans are relationship issues between the Freudian Trio. A Love Triangle slowly brewed amongst the three despite Status Quo Is God. The online fandom latched on to this, creating one of the biggest Nickelodeon shipping wars ever and rivaling some of the greatest Internet Backdrafts. There is a lot of fandom tropes discussed across the various pages for the show, such that the actual term Shipping and the associated pairings (complete with Portmanteau Couple Name) has been directly referenced in the show. As part of the Nick Verse, the show is a Spiritual Successor to Drake and Josh being produced by the same people, and also including Miranda Cosgrove leading the cast as Carly with that show's Ensemble Darkhorse, Jerry "Crazy Steve" Trainor, as Spencer. The two shows could be assumed to be in a wider world setting, with various Schneider-verse references showing up like Galaxy Wars, Daka Shoes, the Gary Coleman Grill, Peruvian Puff Peppers, and the Parker-Nichols Hotel. And don't forget the loads of adult jokes and innuendos inserted into the show. The show has very unstable air dates. Some seasons would air back to back for months, others like Season 4 took an entire year to air less than a dozen episodes and Nick would often call every single episode a special even if it was a regular half hour episode. The currently airing Season 5 stretched the first 2 episodes over a month and called them both specials, but then switched to advertising the episodes as being aired every week from the 2nd episode, iDate Sam and Freddie. After three episodes it went back to airing almost at random. It's so bad, The Other Wiki article for the show's episode guide can't even establish solidly which episode is under what season, as Nickelodeon hasn't come out with any press stating when a season finale or premiere was, leading to Wild Mass Guessing, going off off-hand comments made by the cast and other information they can find, when most networks will state when a show's season ends or begins. The show is confirmed to end after the current season and will be airing a finale special in November. Aside from a character sheet, other sections are listed on the header links as well as a Ho Yay/Les Yay page. Subjective and fandom-related tropes are under the YMMV link while Hey, It's That Guy! is under the Trivia link. Also, the article is now officially Trope Overdosed. This page was last edited on 3 February 2016, at 23:01.